Formulated specifically for the vegan diet, although everyone would benefit from this incredible powder. Healthy as the vegan diet potentially is, there are a few nutrients often deficient from it, notably the vitamins B12, D3, and K2, as well as the amino acids creatine and lysine. This powder not only presents these in a perfectly balanced formulation, it also has a whole spectrum of nutrition, all working in harmony. Feel the Difference. The Culinary Caveman has identified the nutrients that are most frequently deficient from a vegan diet. The best providers of these have then been sourced and carefully balanced to maximise their bio-assimiliation. 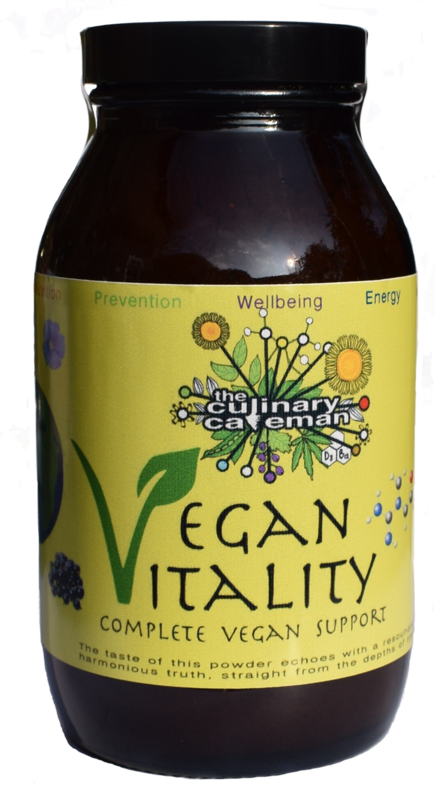 Bursting with the vitamins, B12 and D3 (obtained from lichen); the minerals, iron, iodine, zinc and selenium; Omega-3; polyphenols and much more . . This unique formulation of seeds, protein, algae and seaweed, fruit, leaf, enzymes and root, provides all that the environmental, conscious vegan, may be lacking. A heaped teaspoon (10g) every day is all that is required, in a smoothie, mixed with a milk substitute – just get it inside of you and feel the difference. Unleash your inner caveperson with real multi-vitamins and nutrients.